Glazing is a technique that can be used with all different paint mediums and has several advantages. For many painters the prospect of glazing is daunting, partly because it is built up to be the holy grail of painting – something elusive and difficult to comprehend. In actual fact glazing is easy and comes naturally to a painter once the basics have been grasped. Glazing can be used to give opaque colours a translucent effect. Put simply, because of differences in pigment, some colours are, by nature, more opaque than others. This means that while blues, for example, tend to have a shimmering and glossy feel by nature, light reds and whites are very opaque and dry. Glazes can be used to produce a shimmering effect in an otherwise opaque colour. This is achieved through the thinning of the oil paint with linseed oil, or with a blend of linseed oil and turpentine (called ‘painters medium’), for acrylic, other mediums can be bought, for gouache and watercolour water can be used. The thinned paint (the thinner the better) is then applied to the surface of the painting and is allowed to dry, before another glaze is then added. By building up in this way the intensity of the colour found in the paint as it comes straight from the tube can then be achieved, but with a translucent effect. Alternatively, you may wish to apply only one or two layers, thus creating a very subtle evocation of your chosen colour. Glazing is also used to create different colours upon the painting’s surface. In much the same way that two primary colours make a secondary colour, and a primary plus a secondary make a tertiary colour when mixing on the palette (see related article), colours can be combined within a painting using glazes. To do this simply apply a glaze of one colour over another. You can create a variety of effects by applying over one main plane of colour, different coloured glazes in different areas. This can be seen to great effect in the glazes applied to flesh tones in the work of masters such as Rubens (1577-1640). Green is often applied to skin to give a figure a pallid look. Red is applied over a flesh tone to give the sensation of physical tension, and so on. 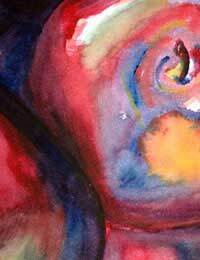 Glazes are also used as a matter of course by watercolour painters, due to the thinness of watercolour. The key here is to use the whiteness of the paper behind the glazes to evoke light, whilst incorporating different colours to show variants of that light as it appears in a given landscape – for example – to the eye. A simple glazing exercise involves simple under painting a canvas with a primary colour (in the case of watercolour leave the surface of the paper white), dividing the surface up equally and applying different glazes in different areas, noting the differences in effect. Within each zone you can also experiment with different levels of layering – from just one layer to as many as ten or more. In this way you will have a good example of the full range of effects available via glazing.